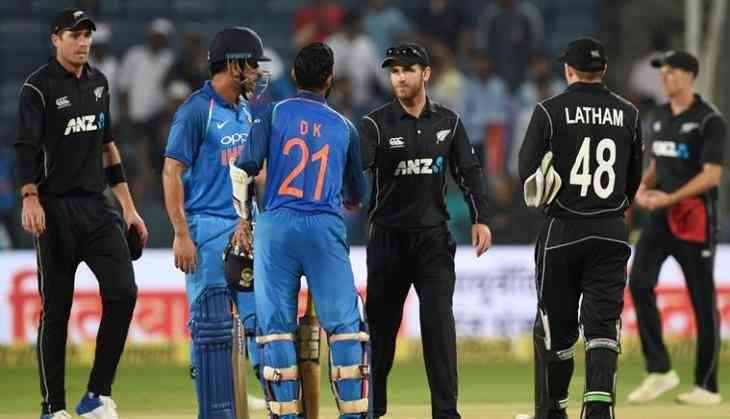 New Zealand skipper Kane Williamson won the toss and invited India to bat first in the fourth and penultimate ODI here on Thursday. In the absence of Virat Kohli, who has been rested for the last two ODIs, Rohit Sharma will lead India. Young Shubman Gill will make his debut for India, while left-arm pacer Khaleel Ahmed has replaced Mohammed Shami. Veteran Mahendra Singh Dhoni is still not fit and will miss the match. India are 3-0 up in the five-match series. India: Rohit Sharma (capt), Shikhar Dhawan, Shubman Gill, Ambati Rayudu, Kedar Jadhav, Dinesh Karthik, Hardik Pandya, Bhuvneshwar Kumar, Kuldeep Yadav, Yuzvendra Chahal, Khaleel Ahmed. New Zealand: Kane Williamson (capt), Martin Guptill, Henry Nicholls, Ross Taylor, Tom Latham, James Neesham, Mitchell Santner, Colin de Grandhomme, Todd Astle, Matt Henry, Trent Boult.